Neils Harbour on the Cabot Trail. Cape Breton Island is one of the world’s special places. Put aside at least 2 days but preferably a few more to explore this northern tip of Nova Scotia, where everything seems to send your senses into overdrive from the moment you cross the Canso Causeway (the stretch of road that’s connected Cape Breton to the mainland since 1955). Summer days are easily filled with whale-watching, golfing and hiking. Tuck into a bowl of fresh seafood chowder at lunch or a feed of lobster straight from the wharf and spend the evening listening to lively jigs and reels at a ceilidh, a traditional musical gathering. In the autumn, the landscape comes to the fore more than ever as the changing tree leaves splash vibrant shades of red, orange and gold across the highlands. But no matter when you visit, you’ll find artisans and craftspeople galore, villages proudly displaying their Acadian and Gaelic culture and some of Nova Scotia’s most engaging museums and fortresses. The Cabot Trail and the Cape Breton Highlands National Park on Cape Breton’s western side should top your itinerary. You can drive through both in a day but a little longer is better. Give yourself ample time to stop at all the lookouts, soak in the atmosphere of little towns like Chéticamp and take in a nature tour or hike. Hardy souls might even take a swim at one of the many sandy beaches! The resort town of Baddeck and its excellent Alexander Graham Bell Museum also demands at least an afternoon, while a circuit of the saltwater Bras d’Or Lakes offers a quieter but nonetheless beautiful alternative to the heavily frequented Cabot Trail. 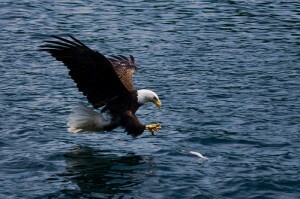 Bald eagles are often seen in Cape Breton. As you’re going between Sydney and Louisbourg, stop by Glace Bay, where a gritty miners museum tells about the area’s past links with coal. You might even find your guide used to work in the pits. Before you leave, make the short detour to the far southeast corner where you’ll find Isle Madame. 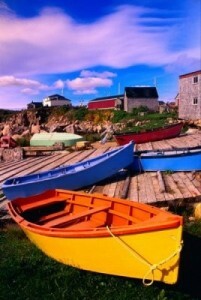 This is a mostly French-speaking region, with one of Nova Scotia’s oldest communities.